The Donald Byrd and Gigi Gryce Complete Jazz Lab Sessions The “Saturday Jazz Show” is Official! If you ask any Jazz expert, they will tell you that Sonny Criss was one of the best alto saxophonist ever. They will also tell you that he never received the credit that should have, that’s certainly true. They even argued that the reason why was because Sonny Criss never left the west coast and that is not true. Refusing to leave the west coast in the 50’s deprived many great Jazz musicians from exposure but that wasn’t the case with Sonny Cross. There were great albums recorded in the west coast in those days but they wouldn’t travel too far, the major Jazz record labels had more of a distribution range and that included Europe. It’s a crying shame but he’s not the only musician that was not totally appreciated until it was too late. 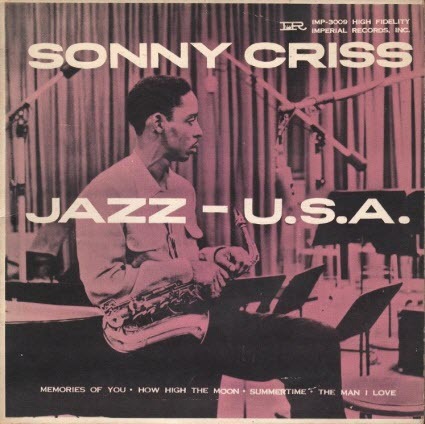 “Jazz-USA” is a true classic but if you just became interested in Sonny Criss then buy the “Complete Imperial Sessions” which contains this album, Go Man!, and Sonny Criss Plays Cole Porter. You can’t go wrong! Sonny Criss and I played together quite a while until I went to study with Joseph Cadaly [a first chair saxophonist at RKO Studies who taught reeds, harmony and solfège]. That’s when Sonny and I split up. He continued into progressive Jazz, and I went and studied. When we split, he started going all up and down the Coast playing and going to Europe. But I don’t know, it just didn’t happen. He’d get records. People said he was great. They played his stuff. But it just didn’t happen for him, and I think that kind of disturbed him. Especially when you put your whole soul and your whole life and just wrap up everything into something and it doesn’t happen. He was pioneering and when you’re pioneering, it’s kind of more difficult to get recognition …. You have to suffer when you’re a pioneer. So that’s what hap­pened, really, I think, with Sonny. He was just early. Tagged with → Jazz Con Class Radio • Sonny Criss • Sonny Criss and "Jazz-USA"